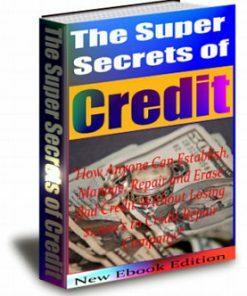 Debt and Credit PLR Website comes loaded with everything you need to profit from a big money niche and you get private label rights to change as you want. 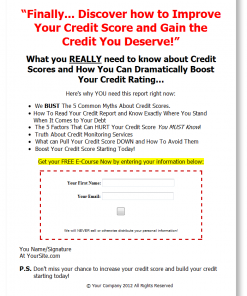 There probably is no better time than now to push anything in the Debt and Credit niche. 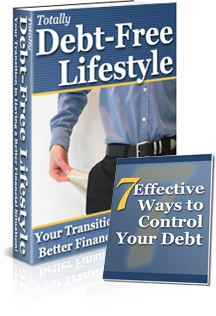 With the way the economy in the condition it is, millions of people are looking to ease their debt and credit worries. This niche has and will always be one of those problems that people will be looking for answers and this is your chance to help them out and make some cash in the process. This is also one of those niches that is evergreen, meaning, there will ALWAYS be people who have money trouble. You sure won’t run out of potential prospects any time soon. This is a high converting niche and the top selling programs such as CPA offers. Not to mention numerous clickbank products. Here is your opportunity to grab your share of a huge niche with a ready to go website that comes pre-loaded with content and so much more. Easier To Install… We set this up so it takes only a few very simple steps to get it up and running quickly. 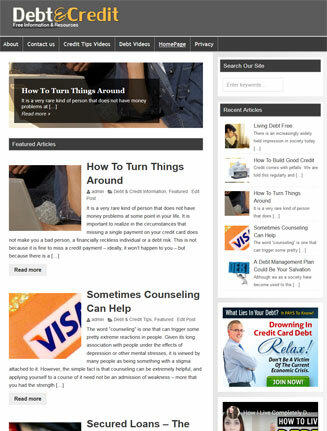 Modern Layout – Your new plr website set up with a professional magazine style theme that includes a main page content slider so you can showcase your content and it also has a home page with sections you can set how you want, showcasing your content and getting more views. It is also loaded with so many options and features that let you easily customize it and make it your own. Point and click simple to change. Responsive Website – Not only is the theme outstanding it is also responsive on all devices from desktops to tablets and even the most popular mobile phones. It works and looks great on mobile devices. This day and age, we can not ignore that buying mobile traffic these days. 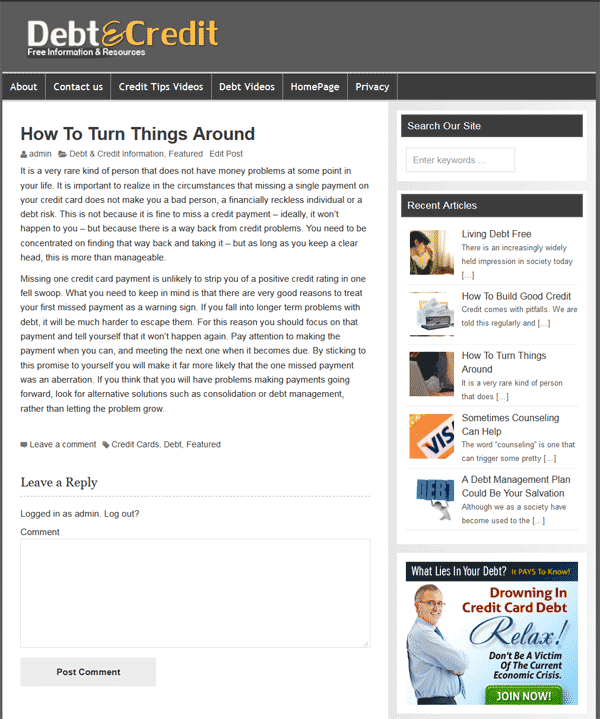 Clickbank Ads – 2 Advertisements for clickbank debt and credit related digital products have already been added to the site for you. The ads are in the sidebar, so they show on every single page of your new website. Related Posts – At the end of every post there are 3 related post listings to get even more of your content in front of your visitors. 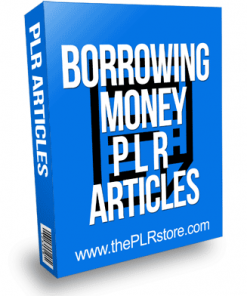 Search Engine Optimization – You’ll be getting a powerful SEO feature that will improve your changes of getting more of your Debt and Credit PLR Website pages ranked in the search engines, which could mean more traffic and buying visitors to your travel plr website. Plus it works on automatic, or you can set exactly what you want. Get some of that buying search engine traffic. Performance Boost – Your new website comes loaded with a feature that helps speed up your website to give your visitors a better viewing experience. No one stays on a slow site and you won’t have to worry about that, we have you covered. Website Security – Your new Debt and Credit PLR Website comes with built in site security to help keep the bad guys from getting in and hacking your site. Also comes with a firewall and malware scanner for even more security. Comment Spam Protection – This site also includes a feature that stops comment spam in it’s tracks and we have proof from using it for years. Just activate and your worries are gone. You can even moderate the comments to the rare spammer will never get anything on your new store. Site Back Up – We know things can happen, so we set up a back up option that backups locally, or backup to Amazon S3, Dropbox, Google Drive, Rackspace, (S)FTP, WebDAV & email, on automatic schedules. You don’t need to worry about losing your work and content. Social Traffic – Already active on the site for you. Here’s a feature that will spread the content of your site around the web and around the world. Social bookmarking icons are active on every post on your site. Social buttons include Twitter and Facebook and more. Of course you can add any social button you’d like. 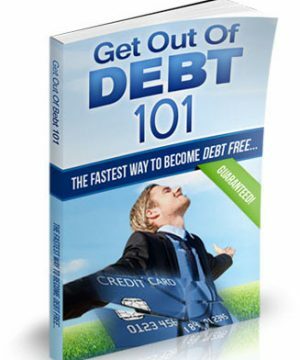 Google Analytics – Option built into your new Debt and Credit PLR Website that will show you exact what your traffic and visitors are doing on your site. This will show how to improve your site. 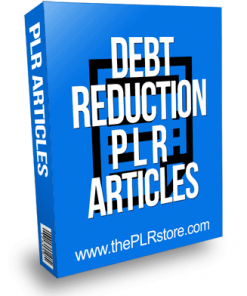 RSS Feeds – This makes it easier to spread your sites content around the internet. It’s also a easy and automatic way to build back links to your pages. Site Map – Google XML Sitemap option to create a map of every single page on your new store. This makes it easier for the search engines to find everything you have to offer and giving you a better chances of getting more of your pages ranked. Tag Cloud – We’ve added a tag cloud that lists your content tags, which means even more pages for the search engines to find and rank. Spam Protection – Another option that comes with the site to help keep out the garbage comments and back link spam. 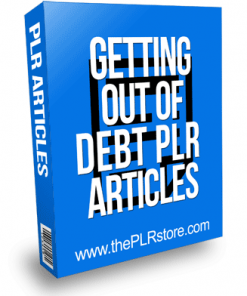 As mentioned, EVERYTHING is included with this Debt and Credit PLR Website, even the WordPress blog files are included. Only a few easy and simple steps and your new blog and review web site is ready to go, ready to make you money. About 10 minutes of install time and setup and it’s up and running. Plsu we are always here if you get stuck.